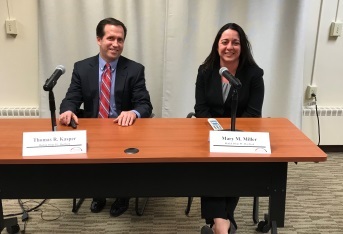 Tom Kasper, a member of the firm's Commercial Real Estate Practice Area, and Mary Miller, a member of the firm's Litigation and Environmental Practice Areas, presented at "Commercial Leases and Environmental Due Diligence." The seminar was hosted by the Young Lawyers Section, Real Estate & Property Law Committee of the Connecticut Bar Association, which is chaired by Paty Jimenez, a member of the firm's Commercial Real Estate Practice Area. The seminar covered common issues pertaining to commercial leases, such as insurance and indemnities, as well as environmental lease provisions from both the landlord and tenant perspectives. For additional information, please contact Tom at (860) 240-1084 or tkasper@rrlawpc.com or Mary at (860)240-1059 or mmiller@rrlawpc.com.